You probably know that Pennsylvania is the poster child for gerrymandering run amok. PA is considered one of the most gerrymandered states in the country, ever since redistricting was done in 2011 based on the 2010 census. It is the drawing of boundaries for a legislative district to unfairly favor a party or an incumbent. 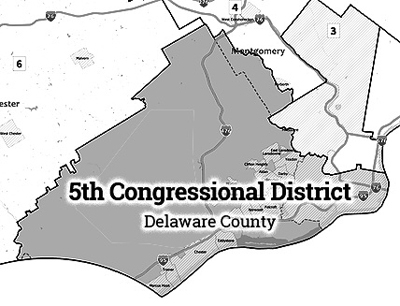 The newly-drawn 5th Congressional District includes the entirety of Delaware County as well as parts of Southwest Philadelphia and a small area in Southwest Montgomery County. What are the consequences of gerrymandering? Gerrymandering lets legislators choose their voters. A fairly drawn map let’s voters choose their legislators. Gerrymandering is a bi-partisan transgression. It can be accomplished by either Democrats or Republicans. The old PA map was drawn by the Republican-controlled legislature. In Maryland, there is a case of gerrymandering done by the Democratic-controlled legislature. You probably have heard that the Pennsylvania Supreme Court had non-partisan experts draw a new map of Federal Congressional districts to be used in the 2018 and 2020 elections. That’s why Lansdowne is no longer in the former First Congressional District. We are in a new district (PA Fifth) that finally includes all of Delaware County, the part of Montgomery County that includes Lower Merion, and a segment of Southwest Philadelphia. The new map does a better job than the old one of creating districts that are compact and contiguous. It also minimizes the distance between voters and their elected representatives; and reduces the number of counties and municipalities that are divided among multiple districts. So didn’t the PA Supreme Court decision resolve the problem? Nope. The new map will be used in the 2018 and 2020 elections. However, after the 2020 Census, Pennsylvania will probably lose a Congressional seat due to a decline in the population of the state. And who will draw the new district map using the 2020 census data? It will be the same legislators who drew the crazy 2011 district map. A non-partisan group called Fair Districts PA has recommended an amendment to the PA Constitution that will put redistricting in the hands of an Independent Commission. Fair Districts believes a Constitutional Amendment creating an Independent Commission is the best way to assure the process of redistricting is fair, transparent, and impartial. This is not a new idea. There are a few states that have adopted the independent commission idea where it is working well. What do we need to do to amend the PA Constitution? The first step is to pass the legislation currently under consideration in Harrisburg by June 30, 2018 (SB 22 and HB 722). Many representatives and senators from both parties are co-sponsors of these bills, but the bill is currently held up in the House Government Committee, chaired by State Rep. Daryl Metcalfe. Please be sure that your State Representative and State Senator for Lansdowne are co-sponsors! The next step is to pass the same legislation next year by June 30, 2019. Finally, there will be a state-wide referendum on a constitutional amendment to implement the independent commission called for in SB 22 and HB 722. If the amendment is adopted, the new Independent Commission will do the redistricting, not the PA Legislature, in 2021. We have a long way to go to reach our goal, but we believe this is the best way to assure a fair approach to redistricting endures in Pennsylvania. To learn more about the NON-PARTISAN group, Fair Districts PA and SB 22/HB 722, go to fairdistrictspa.com.